Order Heating Oil Online Today! With a SAC Energy account you can order, schedule, & pay for a delivery. With discounts & rewards there is something for everyone to love. Don’t overpay for your fuel. Our pricing is always competitive. Payments securely managed with Stripe Payments. Visit LIHEAP's Website for applications & more information on this great program and to get started. Visit OHEAP's Website for applications & more information on this great program and to get started. Sign Up Today & Start Ordering! Want to get volume discounts but don't want to order 200 or more gallons? If you and your neighbor(s) make your order into a group order that order is eligible for volume discounting! To qualify, each delivery must be within .5 miles of at least one other delivery location on the order. Please note, once the order is complete, you cannot add another location to the order. We offer a 2¢ per gallon discount for Seniors 62 and older! This discount is in addition to any volume discount, automatic delivery discount, or group ordering discount you may receive; however, it is limited to a primary residence only. What makes the best pricing even better? Rewards! Get a coupon for each delivery you get! 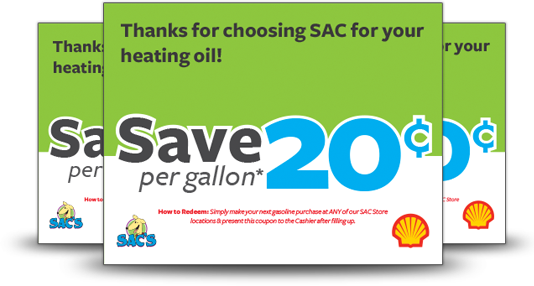 Currently the reward is a coupon for 20¢ off each gallon of gasoline or diesel at one of our SAC Shell Gasoline stations! With heating prices higher than ever, it has never been as important to make sure you are getting the best price possible. That's why we pride ourselves on keeping our price competitive. In our current economy every dollar is important. We understand this and to help we have a low minimum delivery of 100 gallons or 150 gallons depending on your location, allowing you to spend less on your fuel purchase. Still too much? We will deliver less than 100 gallons too; however, there is a price increase that varies depending on your location. Keeping things fresh is always important. That's why at SAC we have smaller storage tanks to keep our fuels fresh. This prevents things such as algae (or fungus) from forming in the tanks and fuels. Don't let your heating bill be a large all-at-once expense. With 8, 9, 10, or 11 Month payment plans you can start paying for heating oil before you need it. Why might you want to do this? For anyone with a budget it creates a steady monthly outflow of money, which is much easier to manage than one large bill. Imagine getting a delivery of heating oil and knowing that you have already paid for it? Our delivery schedule is designed to ensure fast delivery, regardless of your location. If you are out of heating oil please call our offices & we will do the best we can to rush your delivery! Heating Oil is the least expensive and most popular of the heating fuels. This fuel is used best when the fuel tank(s) are located inside the house or underground, since it can "gel" when we get very cold temperatures; Customers with outdoor tanks should strongly consider using Winterized Heating Oil to avoid potential problems when it gets extremely cold. Winterized heating oil is the second most popular product we deliver. Winterized heating oil has all of the benefits of heating oil but is treated to withstand temperatures down to -10 degrees Fahrenheit without "gelling". Winterized Heating Oil is 10¢ more per gallon for the extra fuel treatment. Off-Road diesel can be used for any off-road use that is not used for heating. Tractors, Trains, Generators, and Boats are just a few of the most common uses for Off-Road Diesel. The advantage of Off-Road Diesel to On-Road Diesel is that it is completely exempt from the fuel taxes that would apply to On Road Diesel; resulting in big savings for those customers! Please note that Off-Road Diesel is frequently subject to sales tax. Tell us what you are using the Off-Road for and we can check whether or not you are exempt from the sales tax. Kerosene is most often used in outdoor tanks because it will not "gel" when the temperature drops extremely low. Winterized Heating Oil is a lower cost alternative to Kerosene and provides low temperature protection as well.